​​​​​​​The treasures sparkle and glitter temptingly, so everyone wants to capture as much as possible from the treasure cave — but to do this the players must first find their way to the treasure! 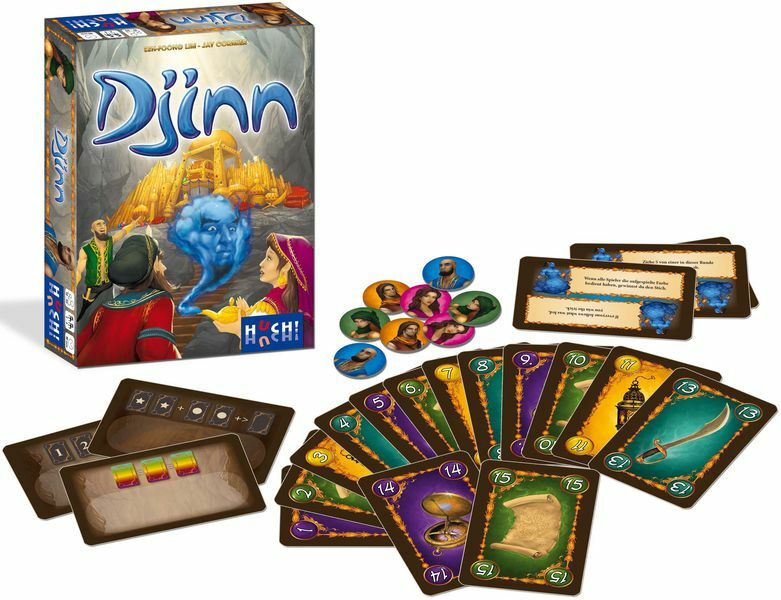 In the trick-taking card game Djinn, every captured trick shows the way to treasure, but the djinn can unexpectedly intervene in the action. Who can enter the famous treasure cave first? 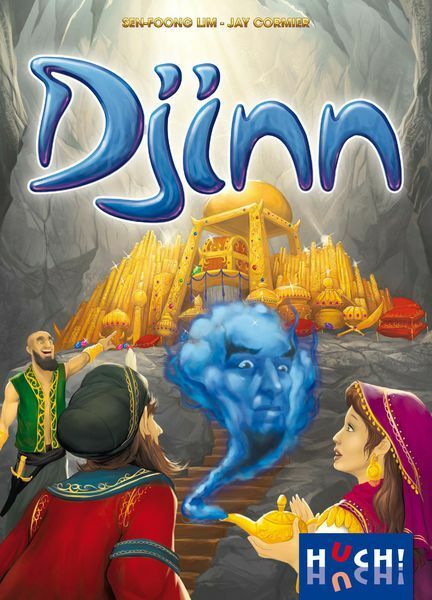 In more detail, a game of Djinn lasts multiple rounds, with each round being eight tricks. Standard trick-taking rules are used, with players needing to follow suit of the card led, and throwing off whateever card they want if they can't follow suit. The deck contains four suits, with cards numbered 1-15 in each suit. Each player starts with a hand of eight cards and one djinn card that contains a special power a player can use on their turn. The top card of the deck is flipped to reveal the trump suit. Whenever a player wins a trick, they keep one card from this trick face up in front of them, discard the remaining cards, then lead to the next trick. After the round ends, players see whether they can discard captured cards to advance into the treasure cave, which is made up of three lines of challenge cards, with each challenge requiring three, four, or five cards depending on the row where it's located. Sample challenges might be to discard three cards that sum to more than 30, three cards of the same color, or three cards in numerical order. If a player completes one of the three challenges requiring three cards, they discard these three cards, then place their player token on the "three challenge" row. At the end of the next round, they can ideally complete one of the three four-card challenges. 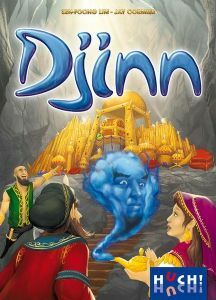 Players who are in the back of the pack receive a bonus djinn card before the next round begins. The first player to complete one of the five-card challenges wins! If multiple players reach this row at the same time, ties are broken by the number of captured cards those players still hold.